A pretty boring and dull movie about a mathematician. This is a movie about a mathematician getting some recognition for his work. Only we never really get the sense of what his work is and why it’s so brilliant. Instead, we spend time following this character on a journey from India to London, where he goes to work for a professor at the University of Cambridge. There we follow him through intimidation, (one racist attacking, and another as s professor who has it out for him,) and sickness. Mostly, what we get is either cliched or boring. So many other movies have told this story better. What we have here, is a very familiar story told in one of the duller and slower versions we’ve seen. It’s not easy to make a movie about a mathematician. After all, as interesting as a proof is, (which probably is not very,) how do you convey that to an audience? How do make an enjoyable movie about someone just sitting down and solving math problems? Sure, there’s more at stake in this film, in the ways of a story of an Indian boy leaving his home and family and traveling to England to spend time with a professor and get his work published, but all of that is not very exciting either. Watching someone travel to a university to sit down and talk about proofs is not exactly fun. There haven’t been many good movies about mathematicians, and the ones that there have been, weren’t really about that. There are at least four that come to mind. Good Will Hunting, A Beautiful Mind, The Immitation Game, and A Serious Man. With Good Will Hunting, the movie was about a troubled young man and his relationships. It was more about psychology and meeting with a therapist than about math. A Beautiful Mind was also about the troubled life of s professor. It included a storyline where he was working for the CIA on secret government missions. Similarly, The Immitation Game was about secrets, war, and codebreaking. And in A Serious Man, what we got was s black comedy about a mathematician’s life falling apart. The only math in that movie was watching this Professor briefly explain the theory of Schroeder’s Cat. So none of these movies was actually about math. And that turned out to be a very good thing. 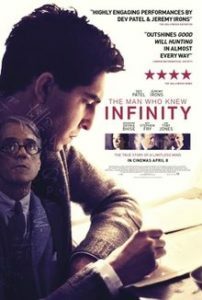 Only, with The Man Who Knew Infinity, we walk away wishing it actually was about math. That’s because the movie doesn’t really explain anything. We hear about these proofs that the main character, Ramanujan, comes up with, and how he can get the answers, but can’t explain how he does it. But we never actually see any of the proofs. It’s a problem. Imagine if in Good Will Hunting, we never got to see Will solve the problems on the chalk board. In A Beautiful Mind, Russell Crowe connected stars in the sky like he was connecting dots. And all of this was meant to show the audience, on a very basic level, what was going on in the main character’s mind. Only The Man Who Knew Infinity never does anything like this. I.t doesn’t even attempt to help the audience understand or relate. It’s not that the movie is confusing, it’s just that we are never given a reason to care. At the start of the film, we meet Ramanujan, working in India, for a business in a small town. His employers are college educated accountants. They like his work and can see he’s destined for better things, and so they encourage him to write to a Professor in Cambridge, England. So Ramanujan does, and then waits for the reply. You know what’s more boring than watching a character write letters? Watching the character wait for a response. Luckily the movie knows that, and so instead of watching Ramanujan just sit around waiting, it plugs in the storyline if him meeting his wife, and getting married. That fits right into this spot as if the movie is just trying to put things in to keep our attention. Soon, the Professor, G.H. Hardy, (Jeremy Irons,) does read Ramanujan’s letter, and responds by inviting the young man to England. Ramanujan shows up there, and begins working for Hardy. The issue is pretty clear… Ramanujan can come up with the solutions, but he can’t explain how he got them. This movie never really resolved that issue. Instead, it tries to break out into different subplots. Ramanujan dealing with racism, Ramanujan not hearing from his wife (and vice versa,) and Ramanujan getting sick. Of these, the only one that is mildly interesting is the situation with Ramanujan’s wife. She writes letters to him as often as she can, and then gives the letters to his mother to send off for her. And she never hears back. It’s pretty obvious what’s happening, but the movie makes it seem like a surprise. The same goes for the reason why it’s happening. We get explanations, as if they are revelations, but really you can figure it out long before you need to. The story of Ramanujan getting sick is what dominates the second half of the film. He catches Tuburcuolsis from being in weather conditions that his body wasn’t used to. His illness gets worse and worse, and he tries to hide it for a while, but eventually has to give in. That’s when the professor comes to visit him in the hospital. The final portions of the movie deal with Ramanujan getting nominated for a fellowship at the University. Hardy pushes for it and is met by opposition. Especially from one professor who Ramanujan kind of showed up while the professor was teaching. Hardy keeps trying, especially when Ramanujan gets sick. 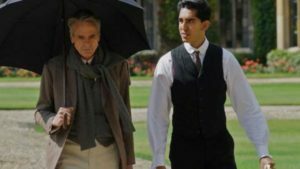 The problem with the Man Who Knew Infinity is that it’s boring. Nothing in this feels fresh or original or creative at all. Nothing is exciting or compelling in any way. The only thing they comes close to a villain is that professor who Ramanujan showed up. And we’ve seen that cliche of an angry Professor who is jealous of his super smart student, a bunch of times before. Movies like Finding Forester and Good Will Hunting come to mind, but there are plenty of other examples too. This movie has nothing new to offer, and while it might tell the story of a real person, it doesn’t do anything to make that story something we should care about. No wonder nobody saw this movie. It wasn’t the least bit worthwhile.